The underlayment you choose matters more than you think. For at least 100 years roof decks have been protected by roofing felt placed beneath shingles, shakes, and other types of roofing. Roofing felt is a breathable sheet which allows humidity and moisture to escape from beneath it, thus maintaining a dry and healthy deck. 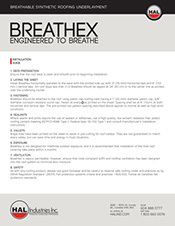 Breathex is our new synthetic roofing underlayment which carries on the well proven tradition of breathability. 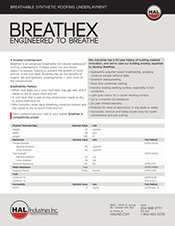 While most other underlayments do not breathe, Breathex does, allowing water vapour to escape from a roof deck. 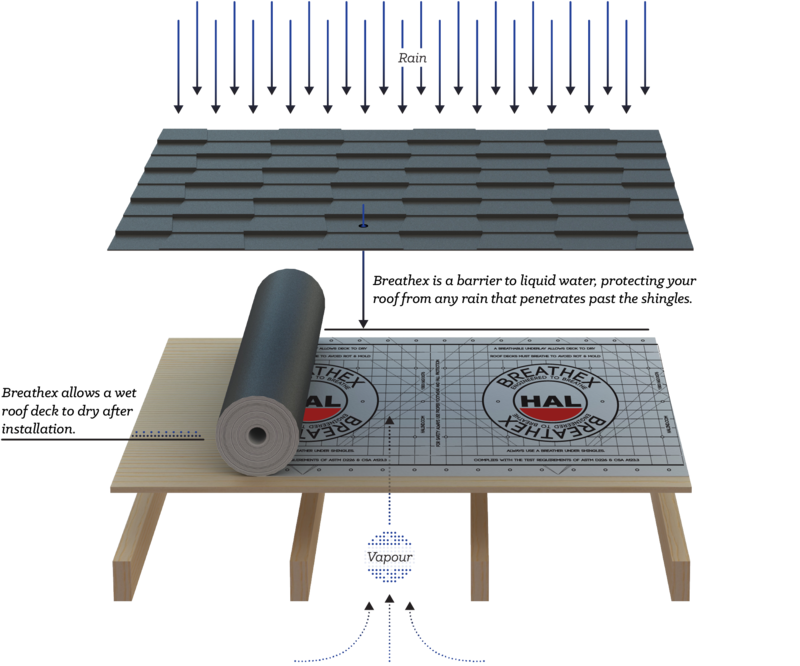 Breathex is the first modern underlayment which makes no sacrifices, bringing with it all the benefits of tradition, but made of truly cutting edge synthetic construction. 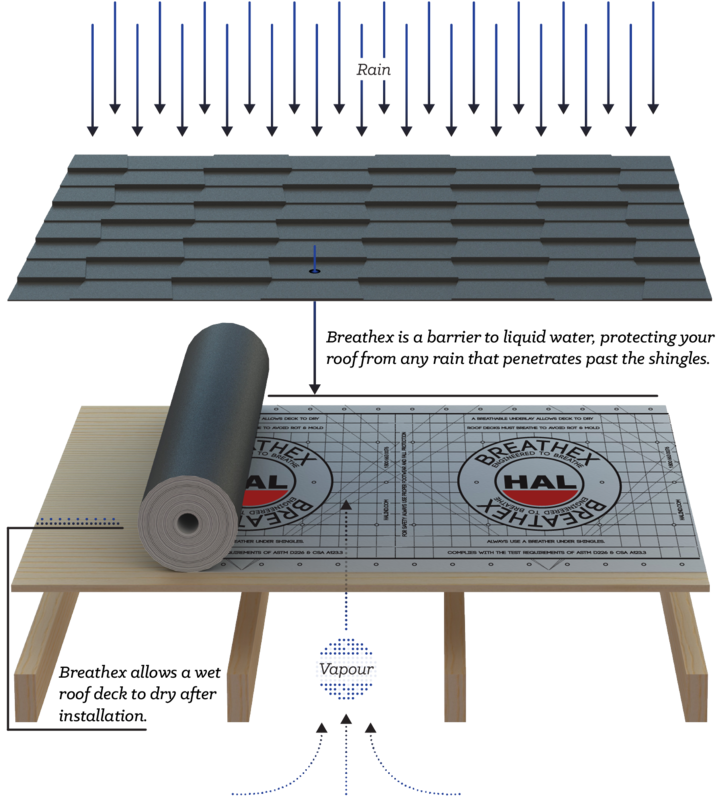 Breathex is the next step in the evolution of roof protection. Attics can collect a steady flow of humid air from today's busy living spaces below. This humid air can raise the absorbed moisture content of roof plywood to a level where unhealthy mold growth can occur, especially if the moisture can't escape from the upper side through a breathable underlayment. The hydrophilic coating on Breathex will absorb water vapour molecules from the roof deck below and release them to the shingle interface above where sun and wind action can disperse them each day. The top side of Breathex is formed out of nonwoven, spunbonded polypropylene fibres, textured so that rain or shine, Breathex has a secure walking surface. This high friction surface gives your boots plenty of traction, and when combined with proper footwear and fall protection, it provides a safer installation environment. Breathex's walking surface is strong, durable, and specifically designed to give your feet excellent grip. The bottom side of Breathex is our custom breathable polymer coating, which provides a tough, rubber-like backing with just the right coefficient of friction, helping the sheet stay in place as it's rolled out and when under foot, but not so much that it can't be repositioned as needed. This coating is what sets Breathex apart from the competition, by both allowing the membrane to breathe and by keeping water out. 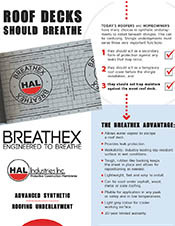 Breathex is made on the most advanced synthetic production line in the industry, taking advantage of the best possible technology to protect your roof. The spunbonded layer of Breathex is manufactured with omnidirectional strength, meaning it has nearly equal strength in all directions, resulting in a more uniform performance in the real world. Spunbonded polypropylene is completely recyclable, harmless to the environment and poses no health concerns. This nonwoven process is combined with a tightly controlled, laser monitored breathable coating application. This production process ensures that Breathex lives up to our commitment to providing the highest quality protective construction membranes. Protecting your home, since 1974.